This guy clearly is the World Champion Etch-A-Sketch artist. I just wish he drew funnier pictures. Snails are definitely not my favorite animal. World Records and the pursuit thereof are definitely odd things however. What possesses people to do these things? 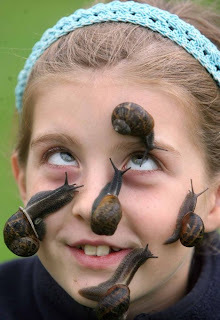 I am happy being an average person never knowing the glory it is to have 25 snails on your face. The previous record was 15. Tania Walton, age nine and the new record holder, previous personal record was just 9. It's kind of like she "Phelped". It's so beyond what was considered great just yesterday. In case you want to try it, the rule is you have just one minute to place the snails and then you have to sit up and have the slithering beasts stick to your face for ten seconds. Whew!